Walter Beutler with a picture of himself holding a 53-pound spring. The long-time Fraser River recreational angler is concerned about the future of the sport. Jul. 1, 2016 8:00 p.m.
Walter Beutler says fishing for sockeye salmon in the Fraser River with a rod and reel is tricky. It’s because the fish aren’t inclined to take the bait from a hook, the veteran fisherman explains. That means getting the hook low in the water and waiting for an open-mouthed sockeye to blunder into a hook. On some days, in a good season, as many as 1,500 anglers like Beutler have tried their luck snagging sockeye on the Fraser, a river that produces more salmon than any other single river system in the world. Sport fishing is an industry worth an estimated $100 million a year for Abbotsford, Chilliwack, Langley and other communities along the river. Beutler has been at it since he was old enough to cast a lure, growing up just a few hundred feet away from the Fraser on the farm his parents owned in Chilliwack. When he was bought his own place, Beutler stayed close to his familiar fishing grounds, purchasing the property right across the road from his parent’s home, a T-shaped lot on Brinx Road. “I’ve been a pretty ardent fisherman,” Beutler chuckles. The biggest catch of his career, a spring salmon, weighed 53 pounds, but he doesn’t spend a lot of time talking about it, preferring to discuss the day his then-10-year-old daughter Shelley caught a 46-pounder and got her picture in the local paper. 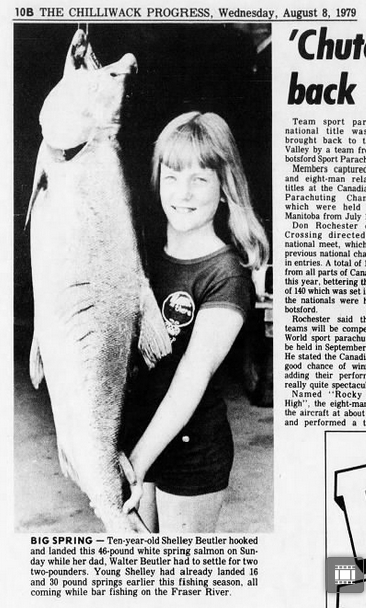 The photo that ran in the Chilliwack Progress on Wednesday, Aug. 8, 1979, shows a smiling Shelley posing with a white spring salmon that is almost as big as she is. Beutler is 78 now, and less inclined to go out in rough weather, but he still loves to go fishing on the Fraser River, with a preference for bar fishing from the riverbank or in a boat. He has eight grandchildren and one great-grandchild, and has taken the two oldest fishing. But fishing in 2016 involves issues that have nothing do with where to dangle a hook, Beutler says, and that may keep him from going fishing at all. “We may not get an opening,” Beutler says. He’s concerned about a proposal that would transfer part of the Fraser River Chinook salmon allocation from recreational fishermen. The proposal was put forward by First Nations representatives during a series of meetings with the Department of Fisheries and Oceans (DFO) in January, March and April. They cited the Sparrow decision, when the Supreme Court of Canada called for a “generous, liberal interpretation” of the aboriginal right to fish the Fraser River. Beutler says when the court decision came down in 1990, he, like most sport fishermen didn’t pay it much attention at first. “I was vaguely aware of it,” Beutler says. As it turns out, the impact of the decision was far-reaching, putting First Nations fishermen at the front of the line when fish allocations are being decided, ahead of sports anglers like Beutler and commercial fishermen. “It shifted things quite dramatically,” Beutler says. Asked if he thinks the court decision was a fair one, now that the full impact is known, Beutler takes a careful pause before he says no. “I think we should all be treated equally,” Beutler says. He is quick to add that he understands the desire of First Nations fishermen to protect their right to food, social and ceremonial fishing. “I can see where they’re coming from,” he says, but insists it should be possible to accommodate the interests of all stakeholders, First Nations, anglers and commercial, without favouring one over the other. The proposal to take some of the allocation from sports fishermen and give it to First Nations is opposed by the newly formed Fraser River Sportfishing Alliance (FRSA), a coalition of Fraser River fishing guides, recreational anglers and industry reps.
Beutler doesn’t like their chances. “The sport fisherman is getting shafted all the time,” he says. Nor is he optimistic about the future of sport fishing along the Fraser, with more anglers chasing dwindling stocks and seasons that get shorter and shorter. “I have to spend a lot more time trying to catch a fish than I used to,” he says. The way the fishery is administered has become more complicated and subject to sudden changes, he says. “They have openings and closures at any time,” he says. A decision on the re-allocation proposal was expected this summer, but instead DFO announced the chinook run would be below threshold levels and as a result all fishing groups would have to accept reduced allocations.